We recently did a little trip up to Black Creek Pioneer Village. That place is AWESOME. The fact that you can visit a basement brewery is just a cherry on top of an incredibly fun day. Since we were already way up in northern Toronto we decided to take the chance to finally visit the new Hafis location of Bellwoods. This location really gives a different view of what one commentator on Instagram called “the most overrated brewery ever”. You see, there are no lines. Not only that – the place is HUGE and you get tons of space, no longer feeling all cramped like one does at the downtown location. 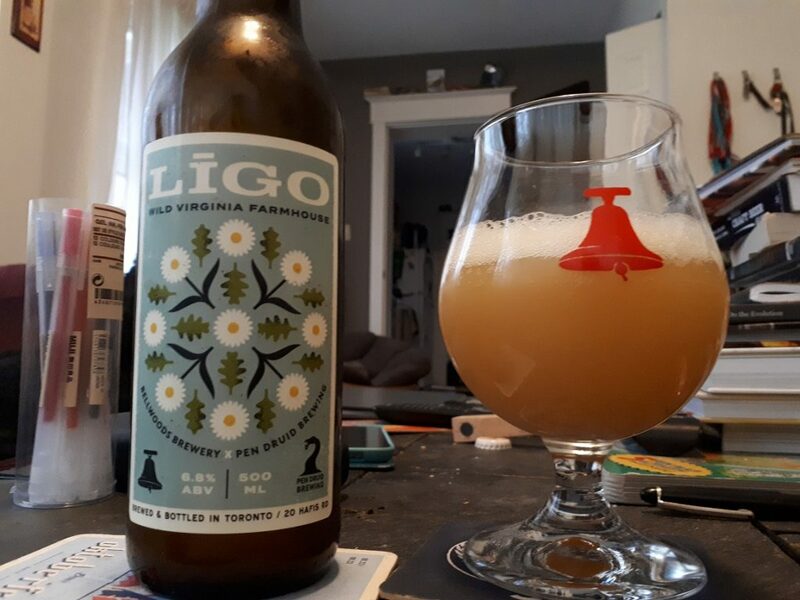 We picked up a bunch of beers while there but one of the unique ones caught my eye: LIGO. It is a beer made with a yeast from a small flower located outside a brewery in Virginia. Technically “wild” I guess, but in a much more controlled way than a classic wild fermented beer. I’m always up for something different so we picked up a bottle. LIGO can only be purchased at the brewery (either location) and it comes in at 6.8% ABV. I am unsure of the current price. Appearance: Very hazy yellow with obvious yeast at the bottom. White head fades very fast. Swirled it a bit to mix in the yeast. Aroma: Like mango juice and horse blanket. Guava as well. Like a smoothy. Taste: it starts with the guava but quickly turns to pizza dough that’s gone sour. Ends with acidic juice notes. Aftertaste: This is the most bitter part. Kind of like chewing grass. Overall: Very unique and quite the experience from start to finish. Don’t pair it with anything, it’ll over power it.